only millions of rabbits, but also untold numbers of grain-eating mammals and birds: wombats, wallabies, kangaroos, pademelons, potoroos, possums, magpies, currawongs, emus, quail - the list is long. For the last 30 years or so, the poison generally used in rabbit poisoning campaigns has been sodium monofluoroacetate, generally known as '1080'. This poison is added to baits such as diced carrots, oats and pellets of compressed bran and pollard, which are either laid along shallow furrows on the ground or spread from an aeroplane. Although the method is successful in helping to control rabbits, some non-target animals - native mammals and birds -also die from eating the baits. Most herbivorous marsupials are highly sensitive to 1080 poison, and some are even more sensitive than rabbits. However, other factors such as the amount of bait taken, the concentration of 1080 in the bait, the weight of the animal and its readiness to eat the carrot, oats or other poisoned bait, also help to determine the actual risk that an animal faces of consuming a lethal dose of the poison. 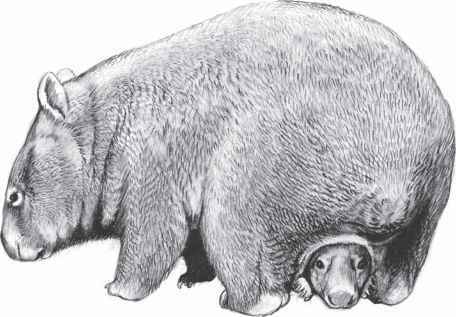 The wombat's bulk makes it less susceptible than small marsupials like the potoroos and pademelons, but nevertheless wombats are killed during rabbit-poisoning campaigns. The numbers of wombats so killed are extremely difficult to assess, as they mostly die in their burrows, and those that die above ground are often in thickly forested country. 1080 poison is also used in wild dog and dingo control, but meat baits are used in this case and these baits are unlikely to be taken by herbivorous animals such as wombats. 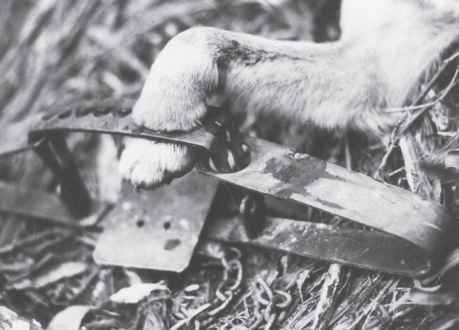 On the other hand, the control of wild dogs by trapping, using steel-jawed traps, kills more non-target animals than it does dogs and dingoes (Figure 7.6). In one four year period (January 1979 to December 1982) nearly twice as many native mammals and birds were killed in dog traps in Victoria as were dogs and dingoes, and 3112 of these were wombats.